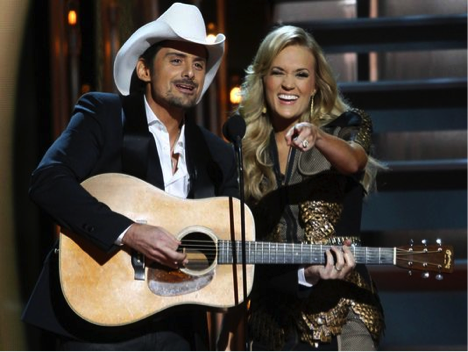 Brad Paisley and Carrie Underwood hosted this year’s Country Music Awards. I mean, who doesn’t love an award show that opens with Luke Bryan as the lead act? The 47th annual CMA Awards was quite the hit this year with many great artists performing such as Florida Georgia Line, Little Big Town, Taylor Swift, George Strait, Carrie Underwood and many, many more. According to ABC, the CMA Awards doubled in digits with its viewers and drew in the biggest audience it has in four years! The two hosts of the CMA awards this year were Brad Paisley and Carrie Underwood, who really brought a lot of laughter and smiles to the crowd that attended country music’s biggest night. The two brought up many jokes about the latest Obama Care, Miley Cyrus’s recent acts and the Duck Dynasty cast. Some special guests that made an appearance at this year’s award ceremony was Sean “Puff Daddy” Combs, Lucy Hale, the Duck Dynasty cast and young Nashville performers who sang to Taylor Swift. There were also a lot of heart-felt moments in the crowd. Taylor Swift was awarded the Pinnacle Award and Luke Bryan sang a song that was dedicated to the passing of his brother and sister. Kenny Rodgers was also awarded by Rascal Flatts and had three of his most famous songs covered by Darius Rucker and Jennifer Nettles. Out of all the many great awards and performances, the “Entertainer of the Year” award was the most anticipated award of the night. George Strait, who is known as the “king” of country music, was awarded the prestigious award this year. The CMA Awards are always a fun, live premiere to watch but this year’s was truly entertaining, heart wrenching and truly deserving to all of those who won and performed. The CMA awards can still be watched by visiting www.abc.com , it will definitely be one that is worth going back and watching!